The Madison embodies the quintessential tambour shape. Handcrafted from a solid hardwood block, the classic features curves as smooth as glass. No finer medium-sized tambour design ever graced a mantel or shelf. 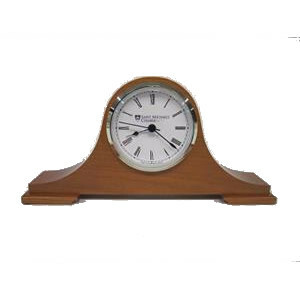 Freight charges are $10.00 for this clock. Any additional merchandise purchased with this order will have separate shipping charges. For an additional $25.00, an engraved plaque with up to three lines of personalized text may be added. Options for personalization are available by phone, please call 1-(866)-213-0727, toll free.